James R. Senger, 79, of E. Prospect Street, Port Washington died March 5, 2007 at Dove Health Care Center in Glendale where he had been a resident for the past month. He was born January 30, 1928 in Slinger, Wisconsin to Leonard and Agnes Wick Senger. He served in the United States Army as a Corporal in Korea from 1950 to 1952. He married Dorothy Altendorf of Port Washington on June 16, 1951 at St. Mary’s Church in Port Washington. For many years they resided on N. Wisconsin Street and in 1978 they moved to E. Prospect Street. 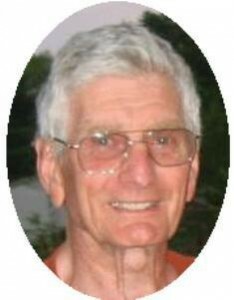 Jim was a Tree Surgeon for Egelhoff Tree Service for over 52 years. He loved being outdoors and cared for many trees, preventing their demise over the years throughout local counties. He retired in 1995. He also enjoyed bicycling, cross country skiing, hiking and was an avid swimmer at the Thomas Jefferson Middle School Pool. He was a member of St. Mary’s Church in Port Washington, volunteering with cleaning and maintenance and a member and past commander of the Port Washington Leathernecks. He is survived by his wifeDorothy Senger of Port Washington and children Jim Senger of Big Bend, Wisconsin, Tom Senger of Racine, Wisconsin, Sue Senger of Green Bay, Wisconsin, Sandi (Paul Larzelere) Senger of Grafton, Wisconsin and Jill Eidenberger of Port Washington, Wisconsin. Further survived by 7 grandchildren, 3 great grandchildren, brother Donald (Gladys) Senger of Cedarburg, Wisconsin, sister Bernice Wood of Bloomfield, Colorado, other relatives and friends. Preceded by his daughter Barbara Senger, brothers Eugene Senger and Leonard Senger and sisters Eileen Vollmer and Ruth Weyer. Fr. Allan Sommer will celebrate a Memorial mass 6 pm Thursday, March 8, 2007 at St. Mary�s Catholic Church, 430 Johnson Street, Port Washington. Cremation with final interment in St. Mary’s Cemetery, Port Washington. Family will receive friends 4 – 6 pm Thursday at St. Mary’s Church. Memorials to St. Mary’s Church appreciated.